NHHS Athletic Director Ray Steinhoff presents his daughter Rachel, one of three receipts of the FRC Scholar Athlete Award. NEW HAVEN, Mo. - The Four Rivers Conference Scholar Athlete Award is given annually at all schools to recognize the seniors who have achieved a high level of excellence both in the classroom and on the athletic playing field. Fey Chavez received First Team All Conference Honors in Cross Country both her Junior and Senior year. Seth Schenck received First Team All Conference Honors in Cross Country all four years and was first team both his Junior and Senior years in the 800m and 1600m in Track. The third receipt was Rachel Steinhoff. 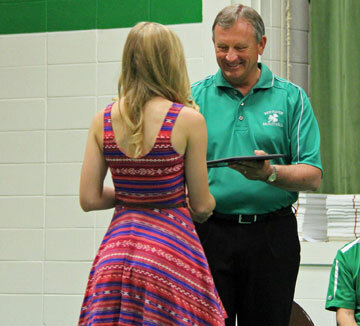 She received First Team All Conference Honors in volleyball and basketball during her sophomore, junior, and senior years and in track her senior year.